Our one week campers wind up staying all year! 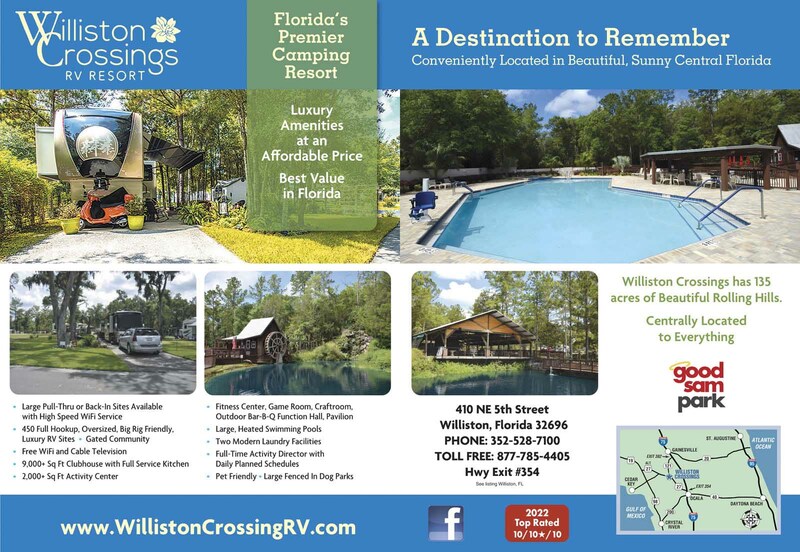 Williston Crossings offers a pristine 135 acre paradise complete with large, paved sites, a lively social scene, onsite amenities, free WiFi and cable TV, and so much more! This is our first time at Williston Crossings and hopefully will not be our last. We came down during January, escaping the NJ winter weather. Everything we heard and read about the campground was realized plus more. There are two gated entrance/exits and all roads are paved and wide enough to easily navigate around. 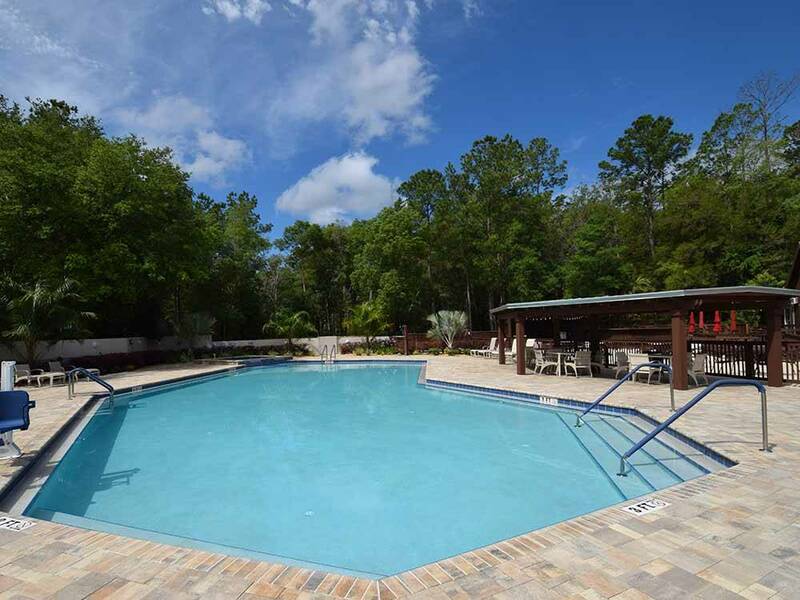 The campground is landscaped beautifully, well-manicured and extremely clean. The office staff was very friendly making sure we had everything we needed (paperwork) and we were then escorted to our site. The site was spacious (for Florida standards), shaded with a concrete slab and patio along with a picnic table. This is a rather large campground one section has shaded sites and another has open sites. We enjoyed playing pickleball the first couple of days there, though they were resurfacing the courts so we had limited time playing. There is a calendar of activities for each day including yoga in the morning, which I enjoyed doing. Two nights we enjoyed sitting around the fire pit, playing guitar, meeting and talking with new campers, everyone was very friendly. Every week they have a meet and greet for newcomers. The bathrooms, showers and laundromat are very clean. We are looking forward to returning next year. we stayed for 6 months and enjoyed the stay. This is a beautiful and well planned resort. The park was full during our stay. The office staff was generally friendly and helpful! The problems we encountered were very very poor internet. Most days you had to wait until after 10PM to have any chance of using the Internet! The next problem is they are activally changing the park to park models which caused division between the RVers and the full timers which was addressed but never resolved. And last they asked for MONE months deposit to reserve for the next year but could not tell us the next years rates. The owner stated if the deposit created a hardship the deposit would be refunded. I have requested my deposit back since the amount of rate increase is more than I can afford. I have not received any communications from the park concerning the rate increase or my refund request. Not sure I would trust anything they say unless it is writing! Even though this is a beautiful resort I would not st here again because of their unkept promises. This was a nice, clean park. We had a pull through site and it was spacious and large. There was also a dog park and an RV wash. Overall everything was very nice and clean. We stayed to dive at the nearby springs so it was a great location for that activity. The pool was also very nice with a zero entry. Some of the features seemed to be closed. I would also recommend staying in the older section as it is more wooded than the newer section. This park also clearly has a lot of fun time or long term residents. Most friendly and inclusive stay of our trip with lots of activities. Definitely returning. Many volunteers help make everything simple. Park looks very nice when you drive through. Sites are nicely spaced. Bulidings and grounds are well kept. But the way it's run makes me rate the park so much lower. Here are some examples: All three trash pickup locations were over-flowing with garbage the entire month of January. Dumpsters were full and there was no place for anyone to put their garbage except on the ground. Often there was as much garbage on the ground around the dumpsters as there was inside the dumpsters. Garbage pick up was only once or twice a week. With a 1000+ campers in the park, it was obvious that more dumpsters or more frequent pickup was needed. It was a significant health and rodent problem and nothing was done the entire month to fix it. Campers down the street decided to play their music extremely loud one day. So loud it was difficult to have a conversation at our site which was about 150-200 feet away. When some other campers who were friends of ours, called to complain, the office staff did address the noise with the offending campers. However, the staff also proceeded to taunt our friends for complaining (for several days). Most of the taunting was very subtle (i.e. giving them "the look") but two of the camp staff actually gave the finger to our friends. Very unprofessional and immature. Later we saw the same camp staff "Partying" with the campers who were playing the loud music. Then we understood who was friends with the staff and why our friends were treated as they were. Overall the way the park is run is very cliquey. If the park staff likes you, they will make all sorts of exceptions for you and bend the rules. If not, good luck getting any help. We had trouble with low water pressure in the showers. Every time we used them the pressure was very low. At times the restrooms were very clean and other times the cleanliness (mostly odor) was marginal. We don't want to leave! A delightful destination park, although we were just passing through and never even unhooked the toad. Beautiful grounds, friendly people everywhere, spacious sites, woodsy but lots of green grass and walking or biking paths. There is even a covered bridge! Lots of snowbirds here and I can see why. I hope to come back someday. This is a gem. Excellent sites, multiple activities, clean and friendly staff and campers. THIS RV RESORT IS A HIDDEN GEM. I HEARD FROM OTHERS THAT I WOULD LIKE IT THERE BUT EVEN WITH THE RECOMMENDATIONS, I WAS VERY IMPRESSED WITH WHAT I SAW. THE OFFICE STAFF COULDN'T HAVE BEEN NICER, THE GROUNDS KEEPERS WERE VERY HELPFUL AND THE VOLUNTEERS WERE AMAZING. EVERYONE TRIED TO MAKE MY STAY ENJOYABLE. Very well maintained and clean park.